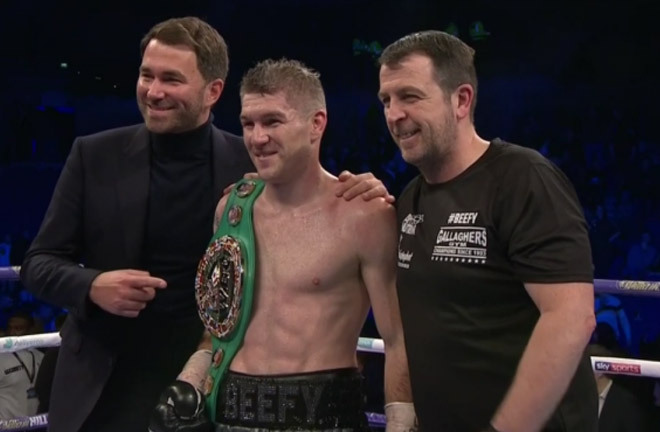 Top of the bill on Saturday night saw former WBO Champion, Liam Smith return to the UK, and his home city, to easily breeze past Sam Eggington in five one sided rounds. Smith picked up the WBC Silver Super Welterweight Title for his efforts. 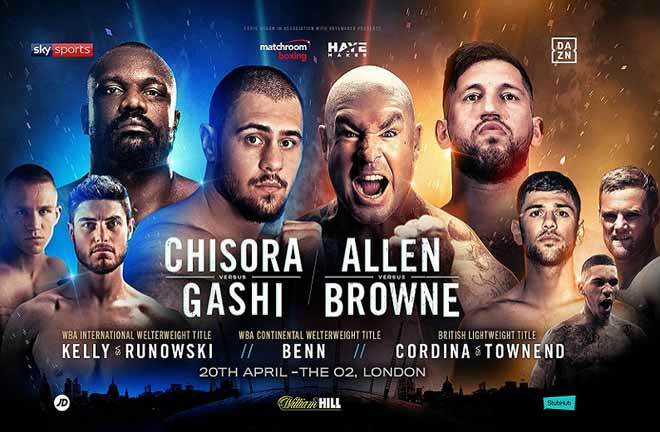 From the beginning, it was evident that Eggington’s power hadn’t transferred from Welterweight, and his shots weren’t troubling “Beefy” at all. Smith caused swelling over the Stourbridge man’s right eye early on, and it was one-way traffic. Although Eggington had the best of intentions, his shots had no effect on Smith. Round two saw Eggington’s head rocked back, and Smith was happy to walk through whatever punches came his way to land his own weightier punches. The Liverpudlian ramped up the pressure, and in the fifth, he landed with unanswered shot after shot to give the referee no option but to stop the contest, as the towel from Eggington’s corner came in almost simultaneously. The win shakes the rust off for Liam, who moves on to another potential World Title tilt in 2019. In the much-anticipated grudge match on the bill, Scott Fitzgerald, a massive betting underdog, upset bitter rival, Anthony Fowler in the fight of the night. Fitzgerald sprinted to centre ring with his jab immediately, and it was give and take stuff throughout. Fowler shaded the early rounds with meaty body shots and decent counter punches impressing. Fowler hadn’t been past six rounds though, and this started to tell in the second half of the fight. He was caught by a big right hand at the end of the seventh, with Prestons “Mad Man” also looking the better fighter in the eighth. 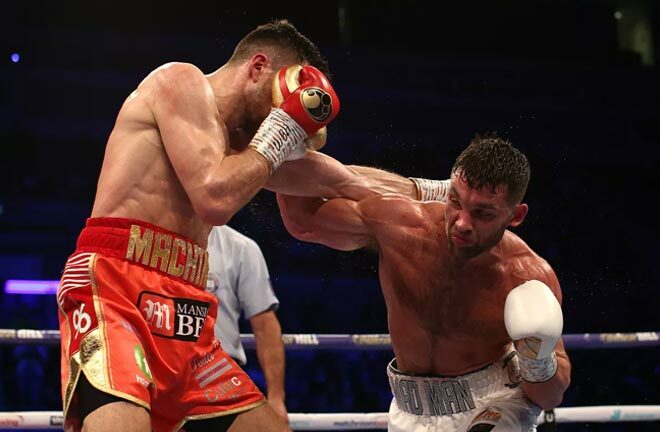 Fowler roared back to life in the ninth though, with a superb uppercut rocking Fitzgerald, who survived a torrid round with Fowler emptying the tank pushing for a stoppage. It was the last round that in the end that would prove pivotal, with “Fitzy” flooring Fowler at the end of three straight hooks. Fowler survived the count but was understandably tiring. Fitzgerald goaded his former Team GB colleague as the fight went to the cards. 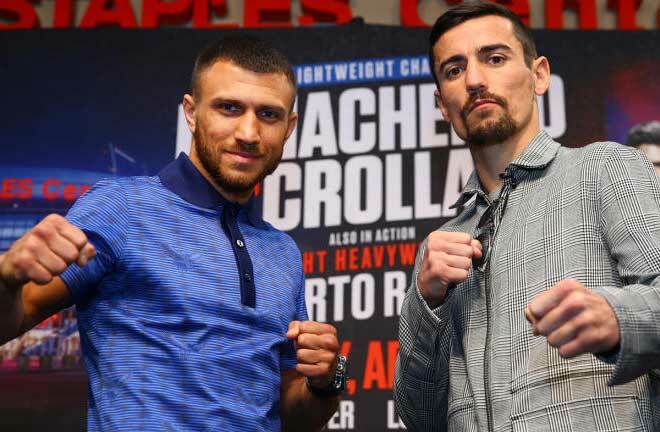 A 96-94 tally for Fowler, was over ruled by two judges scoring 95-94 for Fitzgerald, who also won the ranking building WBA International Super Welterweight Title. It was the right decision, with the knockdown winning the day for Fitzgerald. A rematch is a natural and will surely sell well. In scenes that have no place in society, let alone in a boxing ring, David Price overcame Kash Ali, who was disqualified by referee Mark Lyson for disgracefully biting Price around the stomach area during the fifth round. Ali was well in the fight before the end of the contest. Price managed to land a big right hand though that stunned Ali in the ill-fated fifth, and when both men fell to the canvas, with Ali holding on for dear life, he resorted to biting Price in the torso area, prompting the referee to immediately disqualify the Birmingham man. Price had previously complained about biting in a separate incident, and Ali was also docked a point in round four for hitting behind the head. 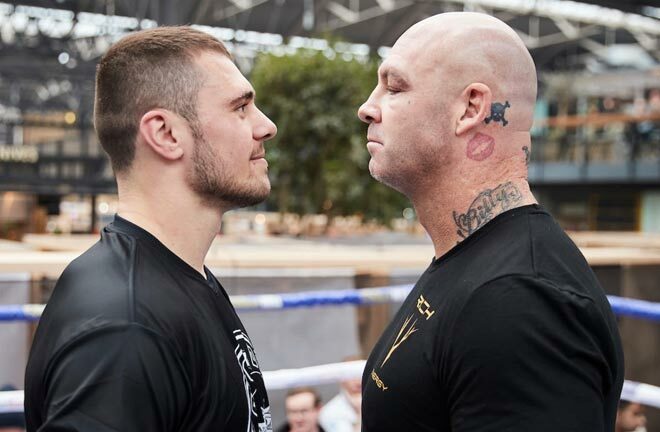 Furthermore, with Price’s fragility, he has been matched carefully of late, but a clash with the winner of the clash between Dave Allen and Lucas Browne next month looks the likely next step in Price’s career. As for Ali, his purse was withheld from him in the aftermath, and a lengthy ban is surely imminent. He was also pelted with several alcoholic missiles as he made his way back to the dressing room. 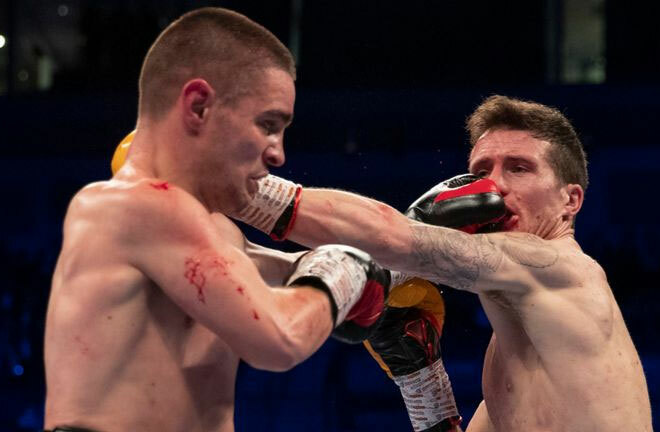 Robbie Davies Junior kept his British Super Lightweight Title, and added the European Title to his collection, with a close and hard to score points win over Joe Hughes. Hughes’ work rate is always impressive, and several of the rounds were difficult to score with both men having their moments of success. Hughes bloodied Davies’ nose in the first round, but Davies kept Hughes busy by switching styles at regular intervals. The blood continued flow from Davies’ nose, and the Merseyside was wobbled in the fifth. The second half of the fight was about what you liked, be it Hughes’ constant pressure, or Davies’ cute footwork and accuracy. Davies finished with a strong final round, and that looked like it may secure a tight point win. Somehow, Terry O’Connor saw the contest 118-110 to Davies, a scorecard which would really take some explaining. 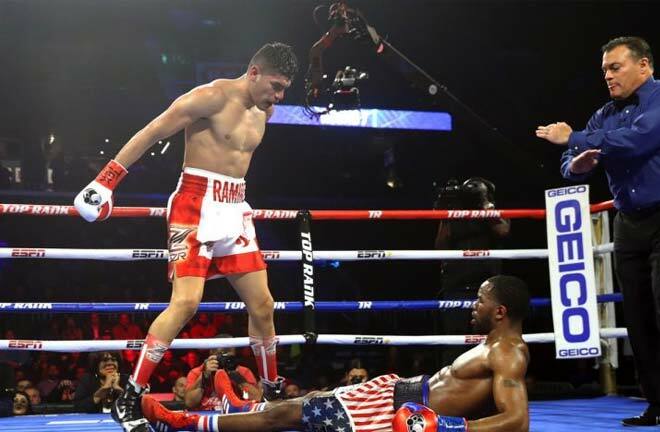 The other two scores of 115-113 and 115-114 were more in line with what happened during the fight, as Davies was declared the winner. 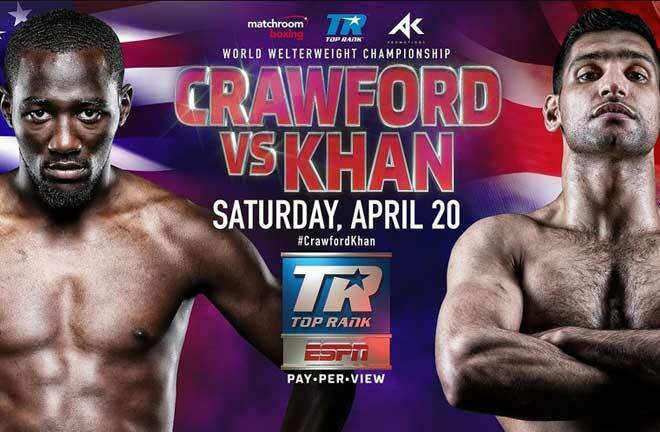 This was another one that you wouldn’t mind seeing again, and a rematch is a possibility for these two likeable men.